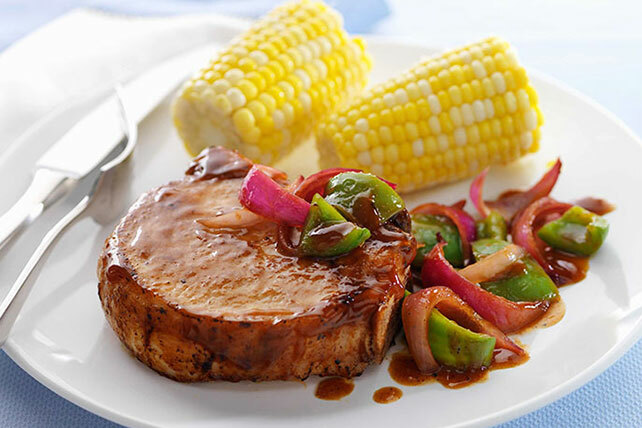 Saucy Barbecued Pork Chop Skillet Honey BBQ sauce, onions and green peppers take to the skillet for this sweet and savory take on pork chop night. Heat oil in large nonstick skillet on medium heat. Add chops; cook 5 min. on each side or until evenly browned on both sides. Remove from skillet; cover to keep warm. Add vegetables to skillet; cook and stir 5 min. Stir in barbecue sauce; bring to boil. Return chops to skillet; spoon sauce in skillet over chops. Simmer 4 to 5 min. or until chops are done (145ºF), turning after 3 min. Remove skillet from heat. Let stand 3 min. before serving chops topped with barbecue sauce mixture.